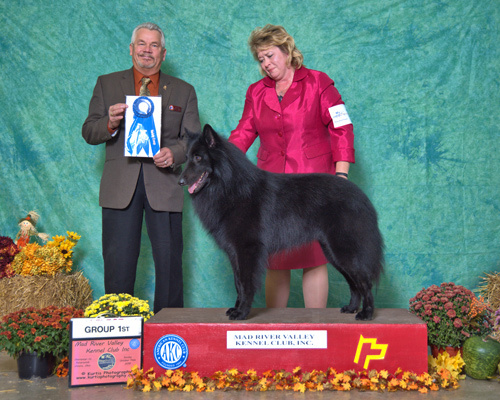 Sarron is a small show/breeding kennel in southwest Ohio that strives to produce sound Belgian Sheepdogs. Sarron Belgians excel in the conformation, agility and obedience rings, as well as the field and pasture. Most importantly, they are all loved family pets. We also have one Irish Wolfhound, Vidarr. This site is dedicated to the abilities and accomplishments of Sarron Belgians and the families that love them. I hope you enjoy your visit to the Sarron Belgian Sheepdog site - and return soon, as updates occur regularly. Please visit the Sarron Belgian Sheepdogs page on Facebook (link to the left) and "Like" us! Thunder is shown winning a FABULOUS HERDING GROUP 1 under judge Mr. James Taylor, on his way to RBIS at Mad River Valley KC Show in Oct 2018.